Many of our creations here at KetoConnect have roots in different recipes, which we troubleshoot and adapt to make our own. We will often take a carb heavy recipe and convert it to Keto. We have a lot of fun ketofying recipes… but every once in a while we get a calling from deepest, darkest corner of our collective tummys that no recipe in existence can answer. A calling for something diabolical. A calling for the Philly Cheesesteak Keto Roll!!! Believe it or not the idea for this recipe came out of my interest in recreating a Fresh Thai Spring Roll. Yes, you’re correct, a Thai Spring Roll is a fresh and healthy ball of vegetables and tofu wrapped in rice paper. So how did that turn into the fried behemoth you are currently reading about? Well, it started when I began to think of what I could use to replace the rice paper. There are some low carb coconut wraps that might do the job, but I didn’t feel like paying $12 and waiting 2 days for Amazon to get them to me…this Keto Roll had to happen immediately. I pop open the fridge and see I have 2 options, 1)Zucchini 2)Sliced Roast Beef. Out of fear of losing my Keto Card I opt for the Roast Beef. I’ve never been the biggest Philly Cheesesteak fan, but since I recently moved to Philadelphia I’ve realized I have to try to fit in or risk being berated by the locals. It’s true what they say about brotherly love, folks. Therefore, I decided to go with a Philly Cheesesteak filling. Since I already had the Roast Beef picked out as a replacement for rice paper(feel free to chuckle at the absurdity with me) this worked perfectly. We’re filling this with 3 simple ingredients. Green peppers, onions, and Provolone cheese(just to stick it to the cheesesteak purists who are willing to throw down if you don’t use Cheese Whiz!). This is the tricky part. After cooking down the peppers and onions for a few minutes(you can keep them raw if desired) we are going to lay out 3-5 slices of Roast Beef on a piece of plastic wrap. If your slices are thicker and don’t have holes in them, you will probably be safe with 3, otherwise add a few more. Layer 2-3 slices of Provolone Cheese on top of the Roast Beef, and then top that with the peppers and onions. Now we roll. It’s easier than it looks, just lift the plastic wrap with one hand and tuck the ingredients in with the other. Classic lift and tuck. Time to apply the breading. Coconut Flour first, then Egg, then Magic Dust. I just coined that term, but I’m sure you know what I’m referring to. Pro Tip: Pat the Roast Beef dry before dipping into the Coconut Flour. If not much flour sticks, that’s ok, the whole point is just to dry it off so the egg will stick. Now coat a non stick pan with a few tablespoons of Coconut Oil. This will vary depending on how wide of a pan you use. You want about 1cm of oil in your pan. 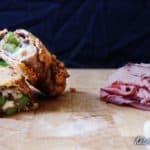 Now place the Philly Cheesesteak Keto Roll into the pan and fry each side for 3-4 minutes. I do 4 flips. Pro Tip: Use tongs to pick up the Philly Cheesesteak Keto Roll and cook the ends for 1 minute each at the very beginning. This will seal them up so none of your filling falls out when it begins to melt. Take the roll out of the oil and place on a paper towel for 3 minutes. 3 minutes is the perfect cooling time if you want it to be almost edible, but still ooze with cheese as you cut into it. Lay the Roast Beef down on a layer of plastic wrap. Overlap each piece slightly. Place the Provolone on top of the Roast Beef, then place the peppers and onions on top of the cheese. Now form the roll. Lift up the plastic wrap with 1 hand while making sure none of the ingredients fall out with the other. If you just keep lifting the plastic wrap it should form a nice roll. Stick 2oz(about 8 Pork Rinds) into a food processor with 2 tbsp of Parmesan Cheese. Blend together until a fine powder is formed. You can do this by hand by placing the ingredients in a ziploc bag and smashing with a rolling pin or wine bottle. Lay out 3 stations. 1) Coconut Flour, 2) Egg Wash, 3) Pork Rind Mixture. Dip the roll into each of them following the order 1-2-3. Allow to sit for 1-2 minutes so the breading settles into the roll. Heat a non-stick pan to medium heat. Add 2 tbsp of coconut oil and allow it to rise to temperature. Place the roll into the pan. Start by using tongs and cooking the ends of the rolls for 1 minute each. This will create a seal preventing the ingredients from leaking out. Cook on each side for 2-3 minutes. Flip 4 times, for a total cooking time of 10-12 minutes.